In the Tuesday, April 16, trading in the euro ended lower. With the price level of 1.1314 knocked Reuters. It is reported that some members of the ECB Governing Council questioned the strengthening of the euro zone economic growth in the second half of 2019, as forecasts are too optimistic. Within two hours the EURUSD came back to resistance 1.1314, but keep at that level it has not happened. Closure of the day took place in the bottom of the intraday range. At 11:00 the euro zone is to publish data on the change in the balance of payments for February. At 11:30 in the UK released the consumer price index, the retail price index, the index Producer Price Index and the Producer Price in March. At 12:00 the Eurozone will publish the consumer price index for March and data on changes in the trade balance for February. At 15:30 Canada will present the consumer price index for March. Also at this time the United States and Canada said on changing trade balance for February. At 16:00 will make a speech the head of the Bank of England Governor Mark Carney. At 17:30 US Department of Energy will release oil reserves according to the Ministry of Energy. At 17:30 a speech made by members of the ECB Sabina Lautenshleger. At 19:30 a speech made by members of FOMC Patrick Harker. 19:45 to give a speech FOMC member James Bullard. Economic Review Federal Reserve "Beige Book" will be released at 21:00 on the United States. Media headlines have caused multidirectional fluctuations, but, as we see, they are not able to change the market sentiment. 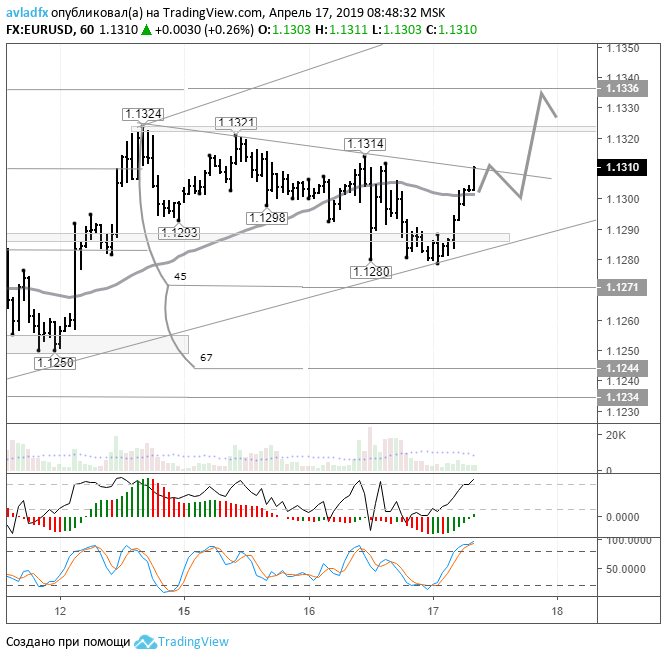 EUR / USD The pair has returned to 1.1314 against the background of good data on industrial production and GDP of China. After a brief consolidation EURUSD, traders should wait for the continuation of the morning rally of up to 90 degrees - 1.1336. Look at the dynamics of the EURUSD from 10 to 12 April. A similar behavior of market participants at present. Recall that in connection with the approach of the Easter holidays and a shorter working week for traders and investors active in the market will decline. Before the long weekend, many traders will want to close the open position. In this regard, the market is expected high volatility.